No bun can wrangle this meaty steer of a burger! The Ozzie burger is robust, brawny and substantial, proof that not all burgers are created equal. 10 years in the making, the Ozzie burger has been perfected. Our flavor artisans have been selecting the perfect cuts of meat and combined them with herbs and spices to achieve the epitome of burger quality and texture – flavor that stands apart from the bun! Made only with all natural prime cuts of beef that are hormone and antibiotic free with no animal by-products ensure quality you can trust. Masterfully blended spices enhance the beef flavor, never hiding its natural goodness. Absolutely no fillers, preservatives or artificial flavors are ever used; we don’t want to mask the natural flavor of the Ozzie Burger. Every Ozzie Burger is made in our federally inspected plant and our beef is hand cut by dedicated artisans that live for their craft, not on a production line were attention to detail can be lost. 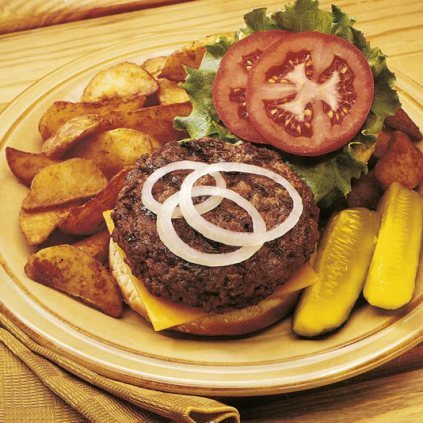 Mixed in small batches to ensure quality and freshness, the Ozzie burger is guaranteed to make you a back yard griller superstar. Put your taste buds and spatula to the test today!